Playing in Gran Canaria happens both on and off-court. For some it means finding a tranquil spot in the sand with umbrella, cocktail and chair. For others it means feeling the island. 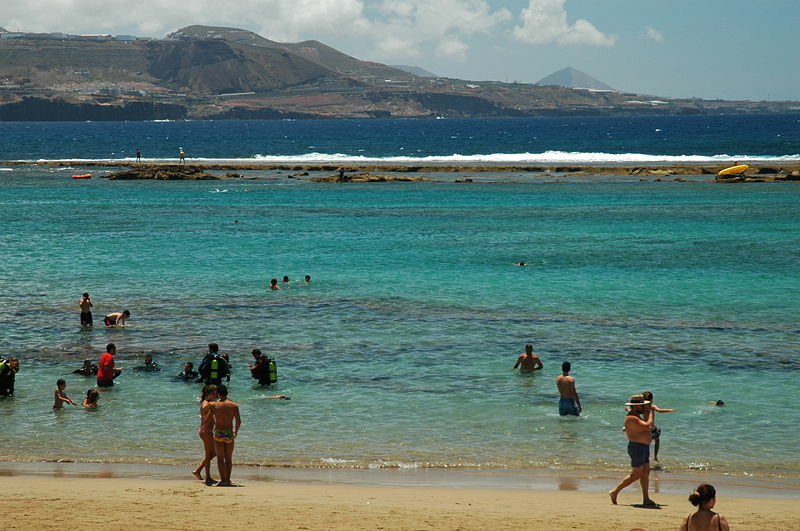 You can easily find terrific beaches in the north and south of the island. But the magic? The magic happens in the interior. If you allow, the island will show you its beauty and you’ll understand why the locals call it paradise. Activities off court surround you in nature, Spanish landscapes, quaint towns, crystal clear waters and more. Weather you stay in the north or the south you can still visit the entire island during your trip. You can take a bus from one end to the other in 50 minutes for approx. 7€. You can also rent a car or book a local guide. If you stay in Las Palmas you’ll be within 5 minutes by car from Las Canteras beach and old town. 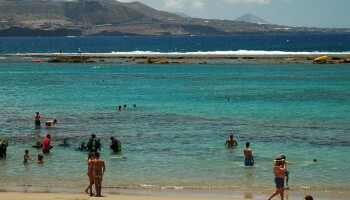 Las Canteras beach is located right in the capital of Las Palmas. Its natural beauty, city-centre location and the services and amenities along its promenade makes it one of Europe’s most famous urban beaches. 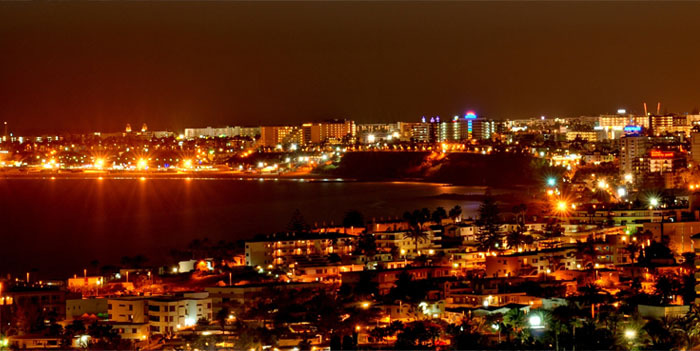 At sunset its beachfront terraces fill up and the promenade’s cafés, bars and restaurants are lively into the night. We walk from the hotel, can sit on the beach and simply watch the beautiful sights while sipping mojitos or go for a fun hike to the “less traveled” areas of the beach and see the amazing rock formations and the many natural bathing pools. Old town Vegueta, the old district in Las Palmas de Gran Canaria, with a history of over 500 years, offers variety and a unique location in the south of the urban area. 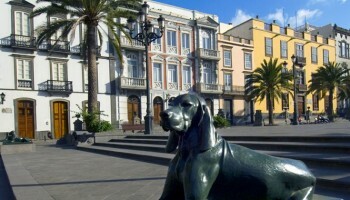 It is today one of the town’s economic, social and tourist centers. The Las Palmas old town is divided in two quarters, named Vegueta (the older part) and Triana, until today one of the nicest and most exclusive shopping boulevards in Gran Canaria. We walk from the hotel, experience a some of Gran Canaria’s history and if you like, spend some time and money in the over 100 wonderful shops and restaurants that we’ll pass by. If you’re in Maspalomas or Playa del Inglés you’ll enjoy Maspalomas beach and Meloneras as they will be within 10 minutes by car from your accommodation. 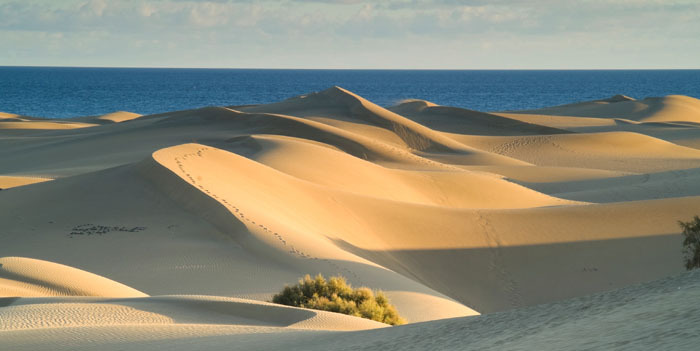 If you’re looking for more resort style in Gran Canaria, look to Maspalomas. 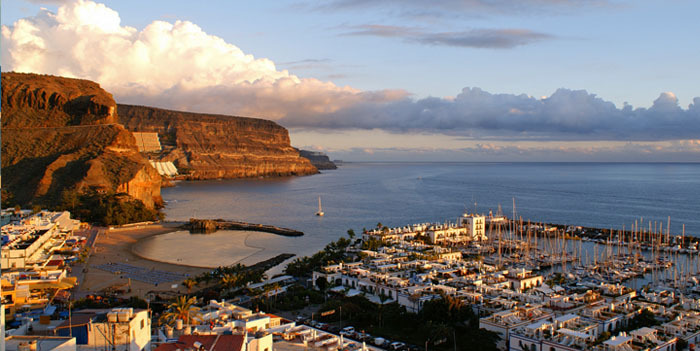 With a touch of sophistication in compared to other areas in the south of Gran Canaria. It’s attractive with a stretch of beaches hard to find to fit anyones tastes. 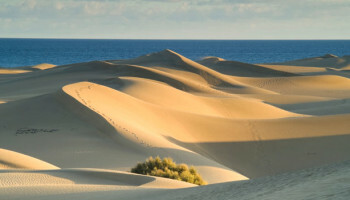 Here you’ll capture the famous dunes and Faro lighthouse typical of the area. Resturants, pubs and the English abound here. It’s also very touristic so prepare to feel that you’ve left Spain behind and entered an international haven of travelers. The one thing you can’t miss – is the sun! For the following areas you’ll need to rent a car (approx. 30€ per day, although you may find it cheaper online) or you can book a local guide and he will take you for 65€ per person including transportation, insurance, snacks and great knowledge. 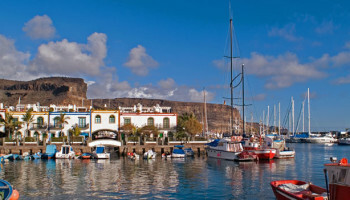 A nice place to stroll is Puerto de las Nieves in the coastal area. 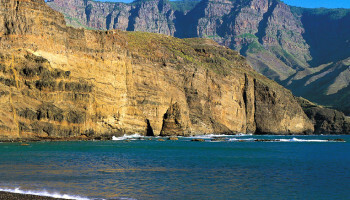 Also the best area to swim in the clean waters of the Atlantic to see Dedo de Dios (God’s Finger) a rock formation reaching out of the sea and a place at sunset to catch the majestic sights of the mountain of Teide. Here you have truly found the interior of the island. Here you find the symbol of Gran Canaria. 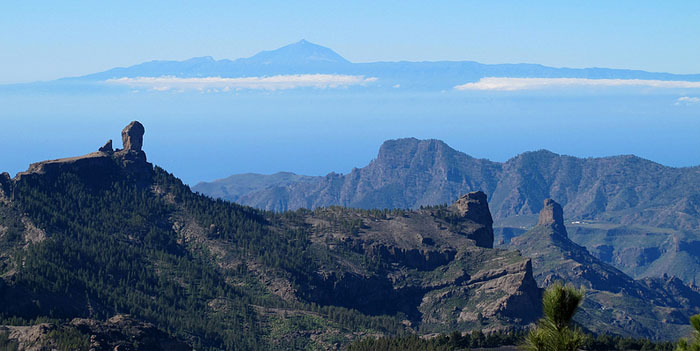 The Roque Nublo an 80 meter rock formation sits 1,800 meters above sea level as if it were guarding the island. 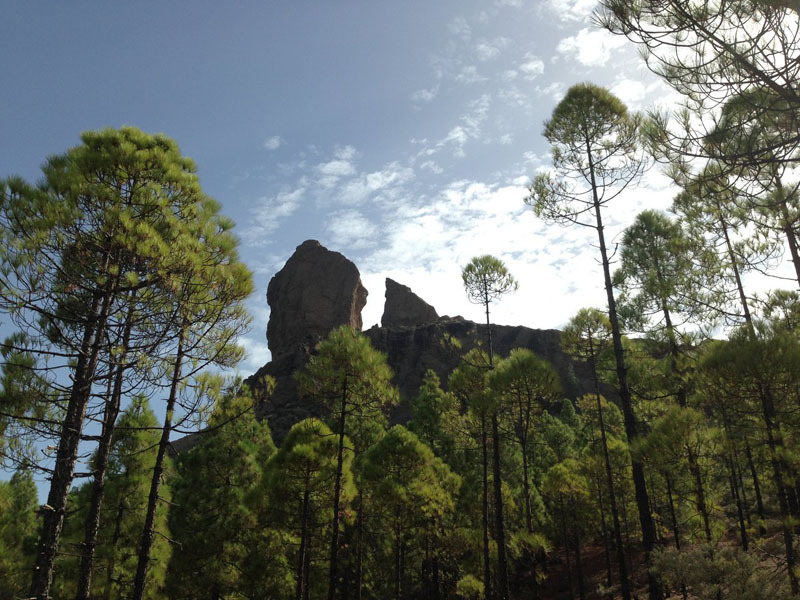 Walking to the Roque Nublo takes place in about 2 hrs both ways. Anyone can do it and everyone enjoys it because at the end there are undeniable views. If you are afraid of heights … tread lightly on this trip. 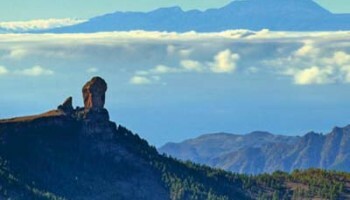 The Roque Nublo shows you just what makes Gran Canaria such a desirable and beautiful island. On a really clear day you can see Teide, Spain’s highest point. 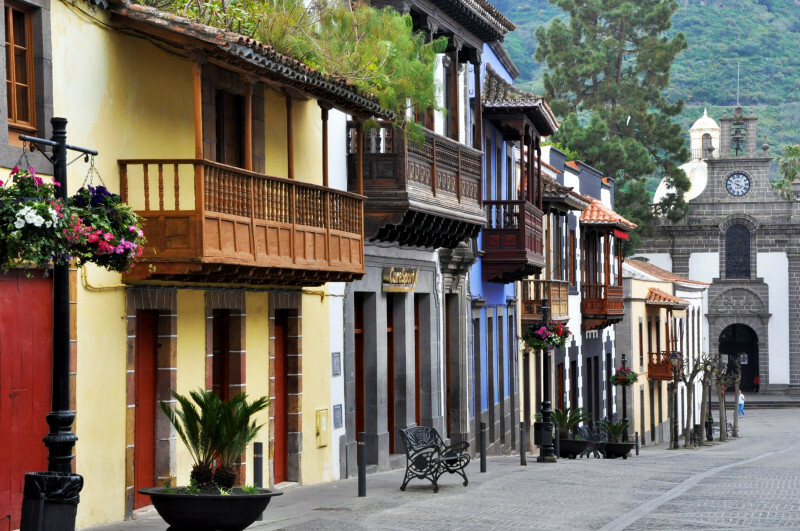 Teror is a place of pilgrimage for the people of Gran Canaria. Therefore a visit to Teror means a visit to the Basilica. 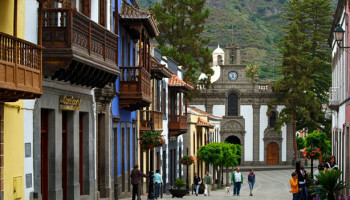 La Plaza de Teror is the main center of town, where you’ll find typical balconies and architecture of the Canary Islands It’s also the central part of the historic center. Shopping in Teror is the best place to find typical Canary Island crafts and gastronomy. Sundays market from 8 – 3 truly showcase all that Teror offer when the locals love to mix with visitors. 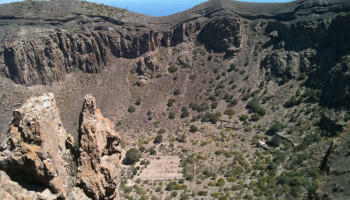 And just getting to Bandamas crater offer an interesting windy scenic drive past old vineyards you arrive at the stunning Caldera de Bandama. 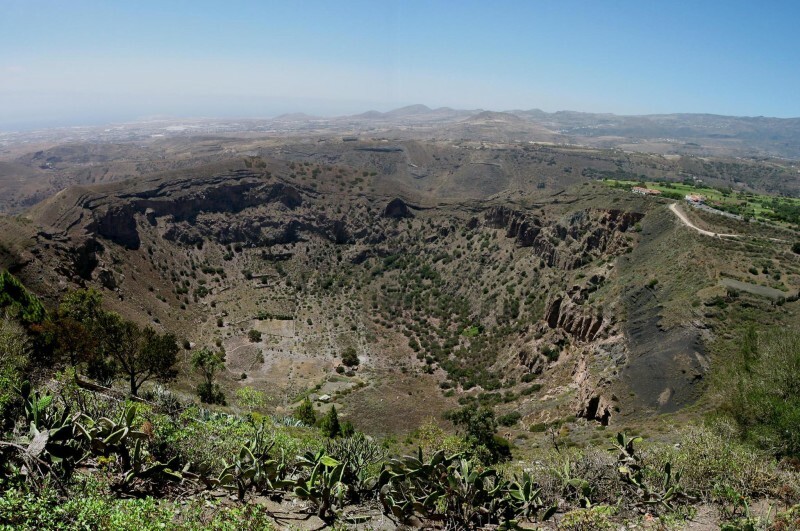 The volcanic crater sits 1000 meters in diameter and 200 meters deep. The peak at 569 meters has an observation platform where you can find spectacular views of the north, east and mountainous center in the west. 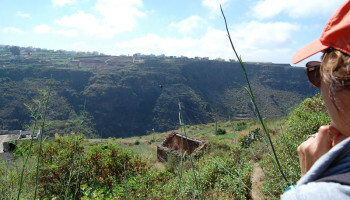 It offers a nice 40 minute hike if you dare to climb down inside of the crater. Although it’s been said it’s views are much more impressive from above. Summer daytime average temperatures are normally in the high twenties to mid-thirties Celsius, usually with a refreshing sea-breeze. In winter temperatures are only a few degrees lower and also daylight hours are longer than those in Europe. For those looking for a chill afternoon or perfect sunset to accompany dinner look to Mogan. It’s charm, colors, florals and fresh sea air rest perfectly in this beachside port. Quaint shopping, resturants and boat rides await in this lovely seaside village, Mogan. Hiking with professional local guides you’ll explore some of the best sceneries of the interior part of the island. Finding lush vegetation, sprawling views, hidden caves and narrow paths leave you with an incredible work out and memories you won’t soon forget. Looking for the Blue Marlin? 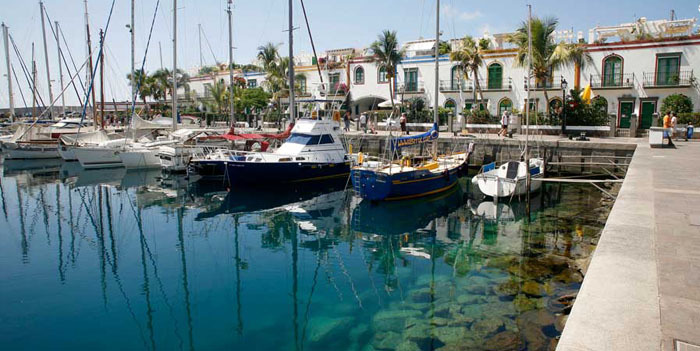 Gran Canaria is known for many species of fish. On your day at sea you may also find dolphins and whales swimming along side you. 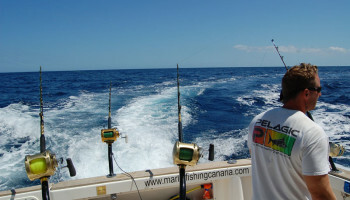 Its crystal clear hue display schools of fish just below the surfice while crusing the costline in Mogán and Puerto Rico. Looking for something not on our list like scuba diving or boat trips? Don’t hesitate to ask.